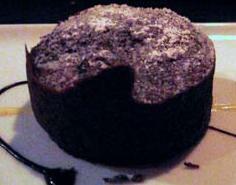 Molten Spiced Chocolate Cakes - individual warm, chocolate cakes ooze with molten chocolate centers when cut into. Cake is nicely spiced with red wine, cinnamon and vanilla. Nice enough for a dinner party or to satisfy your sweet tooth. Would be terrific for the holidays, valentine's or your anniversary dinner! Preheat oven to 425. Butter or spray 6 (6 oz) custard or souffle cups. 1. Microwave butter and chips for 1 minute or until butter is melted. 2. Mix in Red Wine, Vanilla, Eggs, and Egg Yolk. Then add: Confectioner’s Sugar, Flour, Cinnamon, and Ginger. Stir until mixed well. Spoon evenly into cups. 3. Bake for 15 minutes or until sides are firm, but centers are soft. Let stand 1 minute. Loosen edges with knife. Invert onto serving plates. Sprinkle with confectioner's sugar. Serve warm.